We bring vehicles back to life and leave them looking like new. Whether it’s a fender bender or a mechanical repair, Mr. Mike's Auto Coach can efficiently handle any task. Mr. Mike's Auto Coach is a family owned business that has been up and running since 1965. 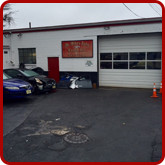 We are an auto body shop specializing in collision and related mechanical repairs. Our core member, Freddie, first purchased the business after working here for some time. After 50 years of dedication to our business, we have made a name for ourselves in the Montclair, NJ area. We are well known in town for our high quality standards with the repair services we provide. Many of our clients quickly become repeat customers after they witness our craftsmanship. We are so confident in our work, that we offer a lifetime warranty on the finished task. When you come to Mr. Mike's Auto Coach, you are always dealing with owners and not representatives. We understand how important your car can be to get around, which is why we always keep you and your vehicle’s interest at heart. We have several accessible payment methods. We accept cash, all major credit cards, and all insurance company checks.